Dennis Rodman is back in North Korea with another offbeat sponsor. The former NBA star teamed up with online betting firm Paddy Power for a series of trips to the isolated nation in 2013. This time around, he's gone in with the backing of PotCoin, a digital currency for the cannabis industry. "Headed back to North Korea. 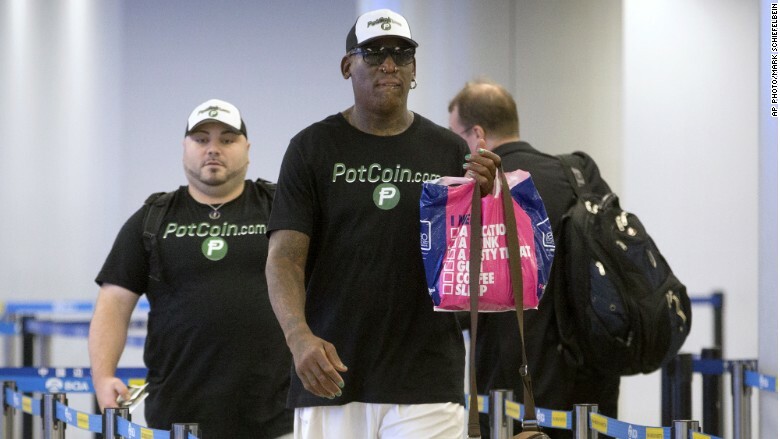 Thank you PotCoin.com for sponsoring my mission," Rodman tweeted Tuesday before taking a flight from Beijing to Pyongyang, the North Korean capital. It's not clear exactly what Rodman is hoping to achieve with his latest visit to one of the world's most repressive regimes. For PotCoin, the goal appears to be publicity. But PotCoin didn't say what the trip has to to do with a bitcoin-like digital currency aimed at transactions between legal marijuana users and merchants. The company's statement quoted Rodman as saying that "the folks at PotCoin ... realized the importance of this trip and made it all possible for me." The flamboyant Hall of Famer wore a t-shirt emblazoned with the PotCoin logo during his flight to Pyongyang. 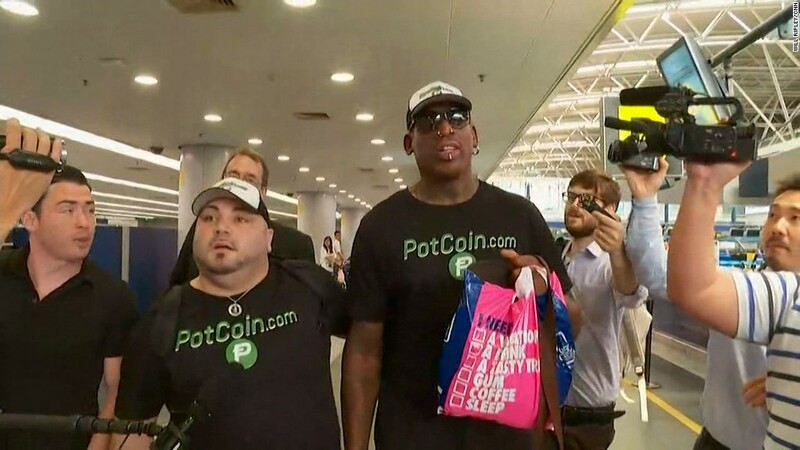 In a response to emailed questions, PotCoin spokesperson Shawn Perez said its primary reason for financing the trip is "because we believe in Dennis Rodman's mission to bring peace to the world." Dennis Rodman at Beijing airport on Tuesday before departing for Norh Korea. One of its founders told the HuffPost at the time that it aimed to gain acceptance "from growers and dispensaries in Colorado or Vancouver, to cafes in Amsterdam." The Rodman link appears to have already sent PotCoin soaring: the currency's value has jumped more than 60% since Monday to around 17 U.S. cents, according to industry website CoinMarketCap.com. The controversy surrounding Rodman's past trips to North Korea eventually became too hot to handle for Paddy Power, his previous sponsor. The Irish betting website ended its relationship with him in December 2013 as criticism mounted, saying it was responding to "the worldwide scrutiny and condemnation of the North Korean regime in recent weeks." That included the news that the regime, which has been widely criticized for its human rights abuses, had executed Kim's own uncle. "We reviewed the project and, with the benefit of hindsight, recognized that we got this one wrong," Paddy Power said at the time. Rodman's next visit after that, in January 2014, included the surreal sight of him singing "Happy Birthday" to Kim at a basketball game and a bizarre interview on CNN. He checked into rehab soon after his return.